Baking, I have thankfully discovered, is like riding a bicycle. Even after a too-long hiatus it is possible, and actually quite easy, to slip right back into the old momentum. And just like any reunion, it is oh so sweet. 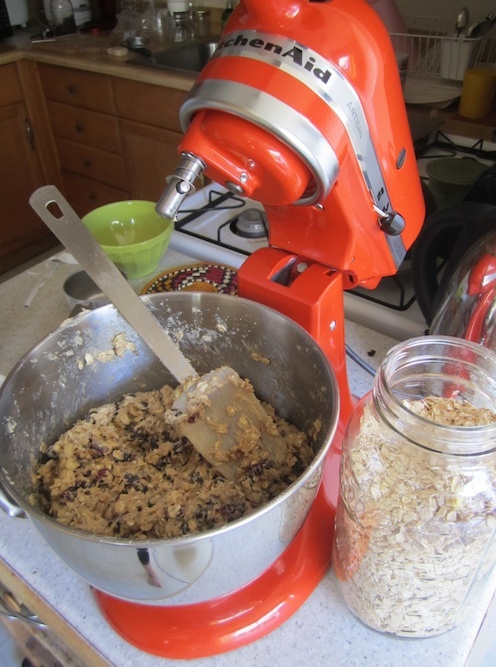 Especially when that reunion involves a KitchenAid mixer that has been waiting patiently – totally unused – in its box for nearly a year, eagerly awaiting that magical moment when it would be brought into the light and put to good baking use. As a kid, I remember watching over and over again a whimsical animated film called The Brave Little Toaster. In it, a toaster of great courage and determination persuades his forlorn friends the blanket, the lamp, the radio, and the vacuum cleaner to venture out into the world in search of the beloved owners who have left them behind. The message that was imparted to me by the film during those formative young years was this: the things we own are things, yes, but they can also have great character in their own right and can bring us a whole lot of joy despite their inanimate state. Thanks to that brave little toaster teaching me that household appliances have feelings too, I have a perhaps irrational love for my KitchenAid mixer. But love it I do, because it brings cookies like these into the world, and a whole host of other baked goods yet to come. Plus it’s the color of persimmons. What’s not to love about that? In a medium bowl, whisk together the flours, baking soda and powder, and the salt. Set aside. In a large mixing bowl, beat the Earth Balance and the sugars until creamy. Add the tahini/almond milk mixture, then the almond milk and the extracts. Mix well. With mixer on low speed, add in half of the flour mixture, mix until combined, then add the rest of the flour and mix until well combined. 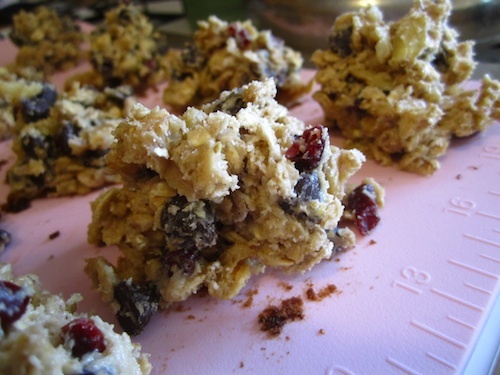 Use a spatula to stir in the oats, chocolate chips, cherries and nuts. Use a nonstick cookie sheet or you can oil or line a baking sheet with parchment paper. Scoop heaping tablespoonfuls of dough onto the sheet, spaced about 1 inch apart (these cookies don’t expand very much). Depending on how large the cookies are, you’ll get about 3-4 dozen. Bake for about 13-15 minutes until golden brown on the edges and doughy in the center. Cool on baking sheet for at least 1-2 minutes (they’ll continue to get firm) before transferring to a cooling rack. Delicious when still warm! 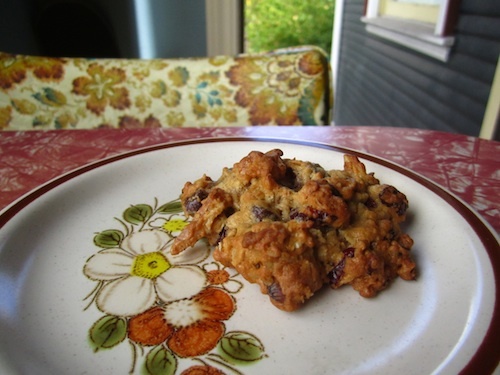 This entry was posted in Not pie, Vegan and tagged cherry, chocolate chip, cookies, oatmeal, vegan. Bookmark the permalink.